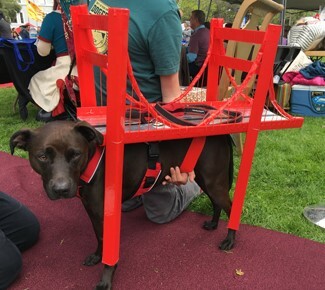 The 11th Annual DogFest returned to Duboce Park on last Saturday, April 7, 2018. Although there were concerns that the steady rain that started on Thursday might not stop in time for DogFest, the rain did stop at about 7 a.m. and allowed the event to proceed as planned. 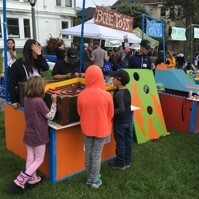 DogFest is a celebration of dogs and kids benefitting SFUSD McKinley Elementary School, a K-5 public school at Castro and 14th Streets, and raised $112,800 this year for the school’s art and science programs. 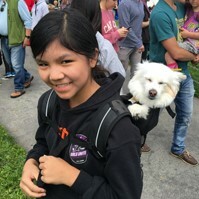 The festival had something for everyone — dogs, kids, and parents of both breeds. 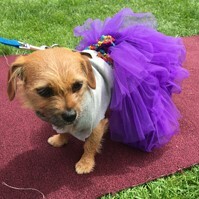 There were great competitions for dogs and their human owners and celebrity judges picked winners in eight categories: Best Costume, Best Tail, Best Trick, Best Coat, Best Mutt, Best Ears, and Best Lap Dog. Celebrity judges included Supervisor Jeff Sheehy, State Senator Scott Wiener, Chronicle columnist Leah Garchick, McKinley Principal Molly Pope, DJ Kristin & DJ Freska from KOIT, and Sister Guard N O’Pansies and Sister Chjola De Dah from the Sisters of Perpetual Indulgence. Comic Dhaya Lakshminarayanan was the emcee. There was half-time entertainment by Cheer SF, a raffle, a silent auction, a Chow Zone, a Rescue Zone, and a Kid Carnival featuring carnival games, bouncy houses, face painting, children’s activities, baked goods, cotton candy, popcorn, and snow cones. 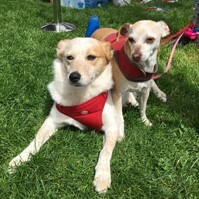 Check out the album of photographs from DogFest on the Duboce Park Facebook page https://www.facebook.com/duboceparksf/.